Are you thinking about skydiving for the first time? Skydiving gives your body a huge rush of serotonin. That’s the hormone that makes you feel really happy – so skydiving, by its very nature, makes people incredibly happy! This all comes from the fact that you’re doing something out of the ordinary which puts different pressures on your body and alerts your senses in a whole new way. Coupled with adrenaline (the result of your body’s natural ‘fight or flight’ response to perceived ‘danger’), serotonin makes you feel alert and very, very happy. That rush becomes addictive, too. 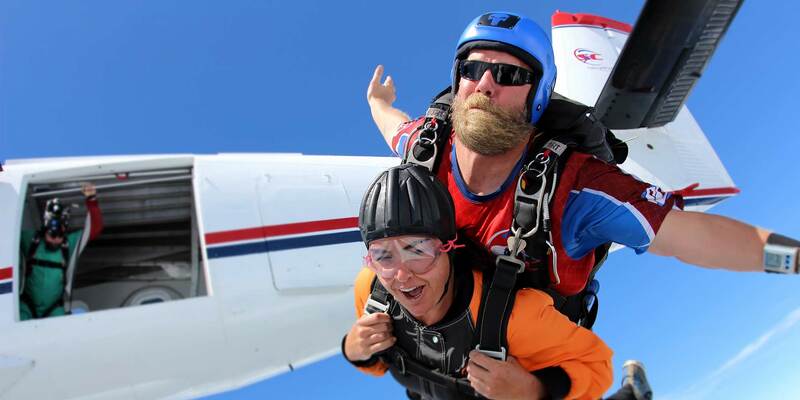 Many people choose to jump again and again after their first skydive because they crave the feelings – which you’ll continue to get whether you’ve made one or one thousand skydives. For many of our first time jumpers, skydiving is all about facing and overcoming a fear. If you’ve ever had a fear of heights, you’re not alone. Around 10% of the U.S. population has a fear of heights – also known as acrophobia – to some degree, whether that’s a fear of being atop a really high building or tall ladder. What better way to face that fear than to tackle it head on? Here at Skydive Carolina, we jump from around 13,500 feet (around 2.5 miles). Jumping from that altitude gives us around 1 minute in freefall and 5 minutes under our parachutes before we return to the ground. Once you’ve gone up that high, you’ll be much more confident in the face of heights in future. You never know… you may even get to like it! 3) Be Empowered… You Can Do Anything! Plenty of people talk about skydiving. But only a select few actually do it. Skydiving isn’t your normal, everyday activity. It’s completely out of the ordinary and so different from anything you’ve done before that it’s fair to say, you’ll have no idea what to expect. Unfortunately, it’s that “uncertainty” that keeps many people from ever giving skydiving a try. They’d rather stay in their comfort zone than plunge into the unknown. What sets skydivers apart is that adventurous spirit and the drive to do something extraordinary. Once you’ve tried it for yourself, you can forever walk with your head held high, knowing you’ve done something brave and different. It’s an empowering thought and one which stays with you for life. That empowerment doesn’t end with the first jump. Skydiving is a legitimate sport. With ongoing commitment and practice, you can learn to skydive on your own and perfect the many skydiving disciplines that exist. You can even compete and go on to win medals in skydiving in competitions such as the USPA National Skydiving Championships. Skydiving is a global community full of people who are committed to achieving their goals and dreams. Being part of this is an empowering feeling, knowing you’re one of the few people in the world who dares to jump but also part of a community of like-minded people who have taken that leap too. Every year, we welcome thousands of first time skydivers who join us to experience world-class tandem skydiving in NC. A small percentage of those people go on to learn to skydive alone and those people become part of the global skydiving community. Whether you jump just once or make skydiving a regular part of your life, it’s an experience you’ll never forget. Come and find out why we love skydiving so much!